When I had this crazy idea to make a list of the things that I held in my heart to be true, I never dreamed I would end up writing a book about them. The process was laborious, but rewarding because my personal faith grew stronger as I dove deeper and deeper into this labor of love. …… You can quote me on that. So many people have supported me as I searched, cultivated and nurtured my thoughts. Several wonderful priests have unknowingly helped me develop this book, and have inspired me with their knowledge, wisdom and insight—especially our holy priests from St. Raymond’s, in Dublin CA … Father Lawrence D’Anjou and Father Bob Mendonca! One of the first to help was Father Gary Thomas, the exorcist of the Diocese of San Jose. He was kind enough to inform me of the nuances, and reality of exorcism and spiritual warfare! Also, Father Thomas Steinke, from Our Lady Queen of Peace, in Santa Clara, helped me fill in the blanks regarding several topics that needed to be developed more fully. I would also like to thank my dear friends who have either strengthened my faith, or read the early drafts of this book and have contributed such valuable feedback—pro and con. Especially: Diane Plume, Alan Napleton, Ann Flook, Mike Aquilina, Dr. Ray Hausbeck, and Ann Ammar! …… Don’t quote me on that. 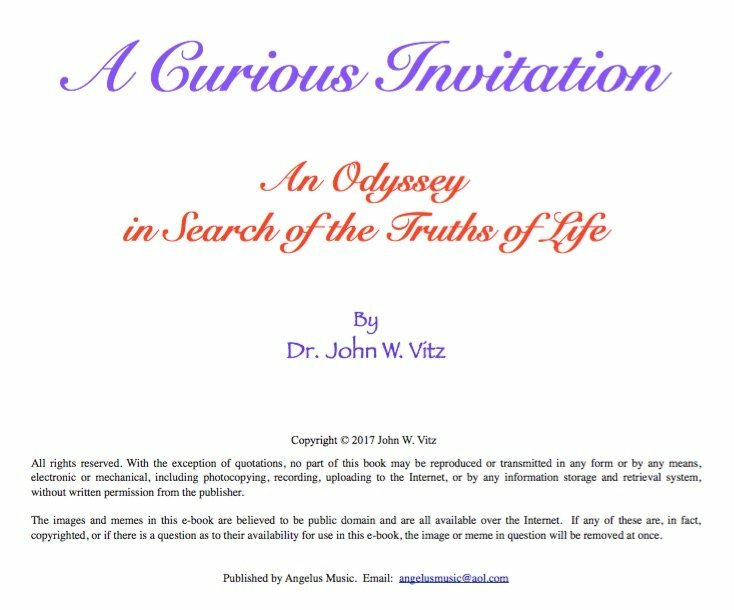 Also, I would like to thank YOU for accepting this invitation, and embarking on this Quest for the Truths of Life! “Our culture has filled our heads, not our hearts. It has stuffed our wallets, but starved our wonder. It has fed our need for facts, but not for meaning and mystery. Chapter 3: Trouble in Paradise! Now What? Chapter 4: Is Jesus Necessary? Chapter 5: Jesus Was a Jew. Does That Matter? Chapter 7: Were the Jews Expecting a Messiah? Chapter 8: Did Jesus Claim to Be God? Chapter 9: Did Jesus Start a Church? Chapter 20: That Ain’t Natural!